Some days I wake up and wonder what in the world is wrong with me. Why am I so driven and ambitious? Why do I try to make my best day better than the last? Why can’t I sit still and do nothing, even when I’m on vacation? Being super is a blessing and a curse. If you’ve been following the development and evolution of me and Super Woman Productions and Publishing, you probably either think I’m a genius or that I’m bipolar. I heard somewhere that being a genius isn’t far from being crazy. If that is true, I probably qualify. Everyday presents a new opportunity in my life. Some of those opportunities are also coupled with challenges. And I’m not ashamed to tell you that since I’ve been in business, I have yet to make a profit. The part of me that serves a higher purpose doesn’t care too much. I know that my greatest commodity is my intellectual property and that as time and technology catch up to what I want to do, I’ll be able to do a lot more and make money at it. The part of me that has bills to pay, however, gets frustrated because my business isn’t showing a profit and obtaining financing from banks is impossible because my business is based on the creative process. Banks don’t invest in people, they invest in profit and loss statements. In spite of that, I’m always encouraged by others in entertainment and business who remind me that although I haven’t turned a profit yet, unlike some other businesses that have turned a profit in their first five years, I’m still in existence and I’m still growing. I’m told that because I’m growing slowly and paying my dues, my rewards will be more consistent and long-term than experienced by many other entrepreneurs. It’s also very encouraging when I hear Len Burnett Jr. from Uptown Media Group and Chris Genteel from Google, speak before a group of business professionals and entrepreneurs and list the things I’m already doing as things that entrepreneurs should be doing to market themselves to the public and become successful is this growing digital age. I’m also undereducated. Meaning, I don’t have a degree. In anything. But I’ve been to college. In fact, I was a straight A student and on the Dean’s List my last attempt to complete my degree in Business Management. I was also bored. After being employed in various businesses since I was 19 years old, and having been a business owner more than once myself, I knew everything that was being taught in the classes I was taking. On more than one occasion, my instructors would ask me why I was even there. My answer: I was told I had to come to this class to get that piece of paper called a degree. Well, I’m going back to school, again. This time I’m going to obtain my Bachelor degree in Digital Cinematography so that I can produce and direct the film and television projects that I write. I’ll get an honorary Bachelors in Business, one day. And if I don’t get my degree in business, it won’t limit me as much as it would in Corporate America. I’m not saying being educated isn’t important. I’m a huge champion for education and I believe it is a necessity. But not having a degree will not hinder a person as much if they have applicable skills, knowledge and experience in place of that degree. This last year has already been an amazing experience for me, and it’s only half way in. Sometimes it has been exhausting. Sometimes it feels like it’s moving too fast, and I want more time in a day to do all the things I want and need to do. Sometimes I have wanted to throw the towel in and quit because it seems like it’s not moving fast enough. When I have those days, something usually happens that makes me change my mind. I get a phone call or an email from someone who seems really excited about meeting/talking to Super Woman. Or I’m out publicly and I’m recognized by someone and they refer to me as Super Woman. Or someone tells me how I’ve inspired, motivated or blessed them with my words or deeds. I like those days. Those are days of reassurance. There are still thousands of people who have no idea that I exist or know what I do. I swear more than half of my Facebook friends only friend me because I’m pretty. If you asked them what I do, they couldn’t tell you if their lives depended on it. But that’s ok. Twenty years ago, everyone didn’t know who Oprah was right away either. Everyone didn’t like Wendy Williams when she started as a radio personality years ago. People thought Tyra Banks was just a pretty model and that she didn’t have the ability or brains to become the media mogul that she is now. We all have our hurdles to jump in order to get you, the public, to acknowledge and embrace us. It’s actually part of the job description when you work in entertainment. Over the next year, I hope to give you all the opportunity to know more about me as a person and learn more about the Super Woman Brand. I also hope to gain your support in my endeavors and community outreach. I’m accepting many opportunities that are coming my way, which will allow this to occur. Although I fight tooth and nail to avoid being in front of the cameras, I don’t really have a choice. So when I’m in front of the camera, I’m going to make sure that I’m doing a good job. When I’m entertaining you, I want it to also be informative. If you see me when I’m in public, don’t be afraid to talk to me. I’m told I’ve very personable and I’m not as shy and introverted as I once was. I plan to also make you more aware of what I’m doing in different ways. However, it is best to subscribe to my newsletter so that you receive the information quicker than through social media. Please, don’t be afraid to share with other people. Forward my blog posts to your friends and relatives, trackback to them if you have your own website (just don’t plagiarise me because I have people who check for that) and follow me on social networks. I’m everywhere that you can imagine and in some places you haven’t heard of. Here is a brief list of some of what is currently taking place in my Super (Crazy) World. Mission Small Business – Vote for Super Woman Productions and Publishing before June 30, 2012 so I can qualify to win the $250,000 Grant at www.missionsmallbusiness.com These funds will be used to fund media projects, hire and train people in media and increase community outreach initiatives like the upcoming I Feel Good: Mind, Body and Soul Women’s Conference. #FabLife Apparel and Accessories – Coming to this website soon. I’m interested in retail partnerships, so if you own a boutique and you’d like to carry my line, please use the Contact Us page to reach out to me to schedule a meeting. Super Video Blogs coming to the OfficialSuperWoman YouTube Channel beginning this week. Because time is becoming limited for me to write blogs, I’m starting quick video blogs that you can watch periodically that update you on my Super World. The Goodie Bag is almost sold out. There’s only about 15 paperback copies left. It will continue to be available in eBook and for Kindle (in 5 languages). Go to The Brand to buy. Sequins & Suits is being held on Thursday August 16, 2012, 6 pm until midnight, at Crave Lounge in Dearborn, MI and the I Feel Good: Mind, Body & Soul Women’s Conference is being held at H.Y.P.E. Athletic Community on August 18. Tickets will go on sale for both very soon. I’ve been nominated for Crain’s 40 Under 40 and Who’s Who in Black Detroit – results are still pending. I feel honored to have been nominated for who I am and what I do. I’m still interested in signing aspiring authors who want to become published. I’m also available to speak at various functions (in and outside of Detroit). If you need a keynote speaker, I’m your girl. Use the Contact Us page to reach me. My media kit will be available at this website soon and will list my rates for different services. As you see, I’m increasingly busy. Busy is good and I’m not even half way done with everything. There are still many other projects and ventures taking place that I’m keeping under wraps until they are finalized. That way, you have something to look forward to – just like Christmas. 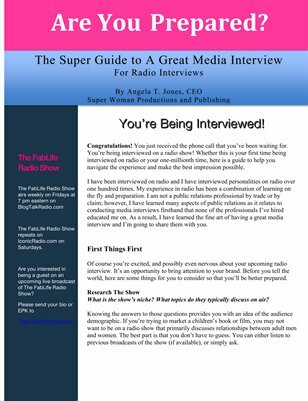 Thank you again for your support of Super Woman Productions and Publishing.